Robert McHale offers practical steps businesses can take to minimize their legal exposure while maximizing the potential gains of "gamification." Even the world's largest coffee chain is rewarding users with virtual points and virtual badges for visiting their retail stores. Starbucks, in partnership with location-based social network Foursquare, allows its customers to check in at their retail locations on their mobile phones and to earn points and special (barista) badges in the process. Although the points and badges generally do not translate into free coffees, the fun experience is designed to encourage people to visit their stores more often and to buy more drinks, while simultaneously allowing the company to gain metrics by which to track consumer behavior. Nike has also successfully embraced gamification to attract and retain new customers. In 2010, Nike developed an app called Nike+ which allows runners to track their runs and monitor their results over time. In addition to tracking their run steps, calorie burn, distances, and duration, users can compare themselves against their friends, and stay motivated with virtual competitions, mid-run cheers, trophies, medals, "attaboys" and congratulatory messages from sporting icons like Lance Armstrong. Players can also participate in a game of Nike+ Tag. Runners compete against each other, and whoever runs the slowest or the shortest distance is designated as "it." Here, gamification is a win-win: for the user, it encourages exercise and a healthy lifestyle; for the company, it creates customer loyalty and more sales of sneakers, accessories and the $1.99 app itself. The fundamental principles behind why gamification works so well to influence user behavior are hardly a recent phenomenon. Consider frequent flyer points, for example. Applying the dynamics and mechanics of gamification to social media interactions (on web and mobile sites) might very well revolutionize how business is conducted. Like all business applications of new technologies, although this explosion in gamification may be heralded as a good thing, there are nevertheless important legal risks to consider. Although the laws governing gamification are still relatively in their infancy (at least as applied to this new technology), there are nevertheless practical steps business can take to mitigate their legal exposure. To balance the business gains of gamification against the corresponding business risks, companies should observe the best practices summarized in the below Figure. 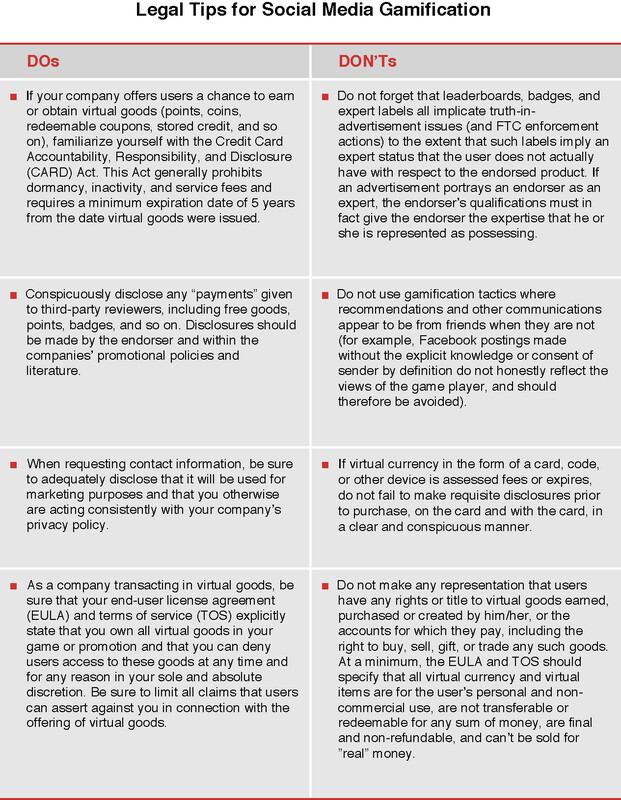 The contents of this article are derived from Chapter 9: Balancing Gamification Legal Risks and Business Opportunities from Navigating Social Media Legal Risks: Safeguarding Your Business. The article is also part of a series in which author and attorney, Robert McHale, provides practical Social Media Dos and Don'ts for companies to consider when using social media for business. The information contained herein is not intended to constitute legal advice or a legal opinion as to any particular matter. The contents are intended for general information purposes only, and you are urged to consult with an attorney concerning your own situation and any specific questions you may have. Robert McHale, Esq. is the founding partner of R | McHale Law, a full-service law firm whose corporate practice represents clients on a wide variety of IT and intellectual property law matters, including privacy and data security, copyright, trademark, licensing, and other proprietary protections. He may be contacted at: robert.mchale@rmchale.com.